August 21 is National Spumoni Day in the United States. This is a holiday for all you ice cream lovers out there as spumoni is an Italian ice cream dessert. Spumoni was first made in Naples, Italy. It was brought to the United States by Italian immigrants in the late 19th century. This dessert consists of three layers of Italian ice cream with thin layers of nuts and candied fruits between them. 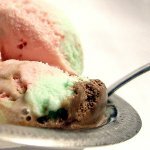 Spumoni is typically made with three flavors: chocolate or vanilla, pistachio, and cherry. Ice cream can be mixed with whipped cream to achieve foamy texture (the word “spumoni” is derived from the word “spuma” which means “foam” in Italian). The main difference between spumoni and ordinary ice cream is that spumoni is never scooped, it must be sliced. It is considered bad taste to scoop spumoni. Spumoni must not be confused with Neapolitan ice cream. Neapolitan ice cream is a spumoni-inspired dessert that consists of three layers of ice cream with different flavors, it does not contain nuts, candied fruits, or whipped cream. To celebrate National Spumoni Day, indulge yourself with this delightful dessert. Spumoni is a perfect treat for a hot August day, so don't miss the occasion! Go out to an ice cream parlor with your friends or family and have a blast.